Why should you Link Pan Card with Aadhaar Card? How to Link Pan Card with Aadhaar Card? 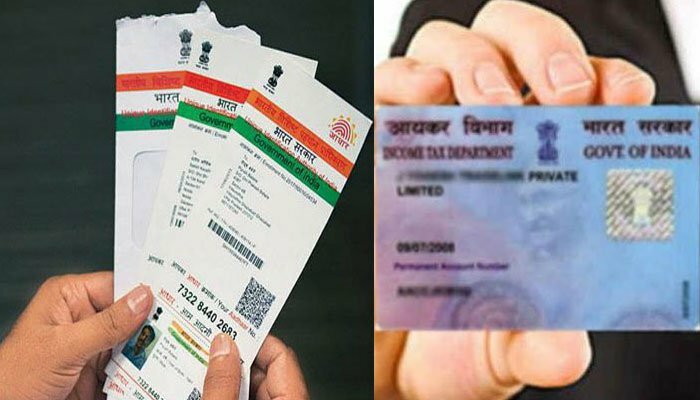 Pan Card with Aadhaar Card: The government of India has decided to make Aadhaar number compulsory for the filing of the income tax returns. Along with that Aadhaar card should be linked to the permanent account number PAN. If you are an Indian citizen, then you should follow these rules for getting better benefits. After this decision of linking Pan Card with Aadhaar card, most of the people just thought it was a waste decision, which gets people into trouble. But to be frank, this process is having some unique benefits for all the people. This idea of, linking Pan Card with Aadhaar card is a well-calculated step, which is taken by the government of India. Now, this useful process can help India to drive towards the corruption free society and corruption free India. Along with that, this is having few other benefits as well. If you are keen, about to know the advantages of Linking Pan Card with Aadhaar card then here I am going to explain them in a proper way. Although these benefits are time taking but these can happen when this process works correctly without any wicked people influence. In this topic, how to link Pan Card with Aadhaar Card let’s see about the step by step process and along with that you can also see the benefits of linking Pan Card with Aadhaar card these days. Let us first get the benefits of Linking PAN Card with Aadhaar Card. In most of the cases, you can call these benefits as the problem-solving steps. As you are curious to know about the benefits of linking Pan Card, let us give a clear view now. Tax Evasion is one of the biggest problems India is facing. Some entities always try to evade their taxes by hiding their own identities. In some cases, few people always try to create fake identities to get rid of taxes. Along with these, they are other people who use undisclosed accounts of other individuals. These are the standard ways where people always hide and run away from taxes. Apart from these cases, there are other individual cases where people who always take two PAN cards to simply show only one class of transactions and hide other transactions so that they don’t need to pay taxes for those transactions. This is a frustrating problem for India, and it needs to be solved. Now this growing problem can be resolved with this linking process. You can really stop the corrupt practice and enjoy the try benefit. When your Aadhaar card is linked with your PAN Card, people will not be able to hide their identities, and along with that, applicants with multiple PAN Cards are not possible. After the linking of Aadhaar card with Pan Card, the government will be in a position to identify all the culprits who are having multiple accounts. Along with that, they can determine a person’s identity quickly with the help of Aadhaar. Especially the biometric fingerprints and demographic information can be embedded into Aadhaar card so they can easily track the fraud accounts. This process will help the government to overcome the mounting problem of Tax Evasion along with that it can easily track the accounts and all financial transaction, and they can apply taxation according to the rules and regulations. Therefore, this is one of the major benefits of linking your Pan Card with Aadhaar Card. One of the frustrating tasks is IT filing; these IT filings have never been easy for the government. This process is complicated, and it is pretty hard to catch up with it. With this linking of PAN card with Aadhaar Card can ease up the IT filing process. The Complexity of the IT filing process can be taken out with the help of linking PAN Card with Aadhaar Card. This process of filling the ITR online will become so easy, and anyone can do it filing easily and quickly. Now, when you link PAN Card with Aadhaar Card, you will be relieved from the burden of submitting IT acknowledgment to the income tax department. It is because your two identities are linked, and government can watch your transaction. As a result, you can be hassles free by eliminating the taxpayers, and along with that, you can also reduce the cost of the incurred by the income tax department in most of the areas. I think I already mentioned about the multiple PAN cards in the first point. Let me say clearly here, linking with PAN card with Aadhaar card can help the government to detect all the culprits who are having multiple PAN cards. As the Aadhaar Card is having the biometric information and other valuable information. In no way, other can create multiple PAN cards and so culprits cannot run anyway. The demographic data will always give the upper hand to the government, and it helps to identify all the people who are using un-honest way to get rid of taxes and final transactions. When you link up your PAN card with Aadhaar card government can easily track all your transaction and it can find out person taxes. The government can also take harsh action on the people who are using illegal and fraudster ways to get rid of taxes. These are the few benefits, which are best to mention in this post. Now let us go to the main topic how to link PAN Card with Aadhaar Card. Now, some of the people might not convince with these benefits, and they don’t want to link their Aadhaar card with Pan Card. If you are one of them, then you should change your mind because of recent government rules. According to the government of India new rule, the PAN, which is called as Permanent account number, should be linked with the Aadhaar Card. If you do not connect your Pan Card with Aadhaar card, then your Pan Card will have a disability by December 2017. A government source has stated this recently. As you, all know that all taxpayers need to have a PAN Number to file an income tax report, but most of the people other than taxpayers are also using PAN card as the identity proof. The government has recently found many fraudulent PAN cards and miss used identities, so they have taken this decision. Although the government official did not officially state this, soon they will. From the Hindustan times, you can see the cutoff date is 31 December 2017. Presently, the Aadhaar card is mandatory for filing an income tax return and for applying a permanent account number PAN. At present, there are over 250 million PAN Cards, and they are also mandatory for a cash transaction, which exceeds Rs 50,000. It is applicable for all hotels, travel bills and more. To get perfect information on transactions government has now curious to launch the linking system. Here people who are having PAN Cards should link them to their Aadhaar card to make their PAN card work for all their transactions. This is the main reason why you should connect your PAN Card with Aadhaar Card. Now, let us finally go through the steps of the linking PAN Card with Aadhaar Card. Most of you might think that linking Pan Card with Aadhaar card is a frustration and daunting process. However, in reality, it is a simple process, which can be done easily with few steps. Step 1: First, you have to visit the income tax department e-filing portal on your browser. This is the first and basic step in linking PAN with Aadhaar Card. Step2: After visiting the official page, register yourself at the income tax e-filing portal. If you have already, done that, then skip to next step or else you have to get register at incometaxindiaefiling.gov.in. Step 3: Log into your e-filing portal on the income tax official site, and then enter your login ID and Password. Along with that, you have to fill date of birth and Captcha code, which is displayed on the site. Step 4: While you log into the income tax site a single pop-up window will appear on the home screen. It will prompt you to link your PAN Card with Aadhaar Card. Step 6: After clicking profile, settings just click on the option Link Aadhaar. Step 7: Now details such as the date of birth, gender, Name as per PAN details will already be mentioned as per the details submitted at the original time of registration on the income tax e-filing portal. Step 8: Once you see all the details, just verify those details on the screen with the original details of the Aadhaar Card. Step 9: Now if your all details are matched with original Aadhaar card. Then you can enter your Aadhaar Card number and the other captcha code in the captcha box. Step 10: After entering captcha and Aadhaar card just click on the “Link Now” Button. Which appears in green color right below the captcha image code. Step 11: After the whole process is done, a simple pop-up message will appear on your screen. This pop-up will inform you that your Aadhaar Card has been successfully linked with your PAN Card. These are the simple steps to link PAN Card with your Aadhaar card. In some cases, the details of the Aadhaar Card and PAN Card did not match. Then you have to rectify them as soon as possible. In other cases, detailed information on the Aadhaar do not match with the details show on the website. In all those cases, you have to ask for rectifications. You can only change the details just by easily updating your profile and then you can ask for a fresh and new PAN Card. If you want other, alternative then you can modify all the details on your Aadhaar card, and then you can alter and ask for replacement of Aadhaar card. Both these process are better in modifying the information on your Aadhaar Card and on your PAN Card. Here all you have to remember one thing that is both of your cards should be identical then only you can link your PAN Card with Aadhaar Card. If your details are wrong and not identical, then you cannot link your PAN Card with Aadhaar Card. Therefore, you have to take proper care of the information. Most of you might think that you have to submit other documents to link PAN Card with Aadhaar Card, but other documents are not required in link PAN card with Aadhaar Card. As your biometric and the non-biometric information is already stored in the database of the income tax e-portal and UDAI network as well. This is all about the linking process of PAN Card with Aadhaar Card. I have written this step-by-step guide because most of the people are searching for the best and possible answer for this issue. Therefore, I have tried my best to get the steps perfect. I hope you all linked your PAN card with Aadhaar Card with this process easily. If you are satisfied with this quick process, then you can share this with your friends and family as well.